TPC Frequency Converter are rugged and reliable if you are looking for best frequency converter, we are the one stop destination for you. 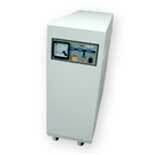 We are rated among the topmost Frequency Converters Manufacturers from India. Our name also figures in the list of leading Solar Inverter Manufacturers. We present excellent quality frequency converter that is widely used in defence establishments as well as aviation industries that are used to provide stabilized one frequency to other user desired frequency. We ensure easy availability of these converters that too at the most affordable price. TPC offers a wide range of advanced and intelligent TPC Electronic Frequency Converters solutions both single phase three phase input output with variable frequency from 60Hz to 400Hz. Frequency converter is designed for Defence establishments and aviation industries to give constant amplitude and frequency. These Frequency converters supplies the required output as per the specification, and protects the equipment from the irregularities of the commercial mains supply. Frequency converters are of superior design and quality. The Frequency converters are manufactured using the highest quality components, with precise assembly, subjected to high quality testing and inspection procedures.